Hi! Here is my weekend photo report. As I wrote before I spent this weekend on the countryside, viewing how the nature slowly wakes up. The weather was great - icredibly blue sky, warm sun - just perfect for having picnic. We were near the nice pine-tree grove. Ground was covered with pine cones and needles. In such surrounding I usually forget about all my everyday troubles/work and fast big city life. And try to absorb nature's energy, patience and beauty. I’d like to spend more time closer to nature, hope I’ll have such opportunity in future. For now I sometimes get only small portions of real nature closeness. That's why I try to get as much as possible from such events. Here are some buds pictures. I’ll have quite a big collection of buds photos soon. I used to photo them a lot this spring. I missed all those greens and flowers in winter and now I'm unbelievably happy that they finally appear. Sorry for such amount of nature photos, that's just what I'm happy about now. The buds period usually is very short. 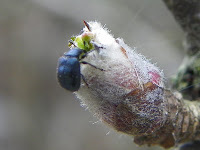 You just begin mentioning small green buds on the trees and look at this - everything is green and juicy - time flyies. So I'm catching the moment. Take a look at lichen on the trees. Doesn't it look interesting? Fortunately we’ve met some local inhabitants. Serious hedgehog. And a lot of busy ants on a tree. It was very hard to take a picture of 'em, cuz they move very quickly. After exploring the territory, we finally started our picnic preparations. By the way, I’ve invented a great recipe of grilled chicken, that I’m going to share with you right now. Generously cover each piece of meat with the marinade. Leave meat on about 12 hours. Grill until it’ll get crusted over. 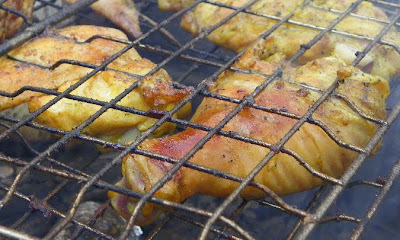 Here's a picture of our chicken been grilled. It's a little bit smoky, but you still can see the goldish crisp on it. Yummy!